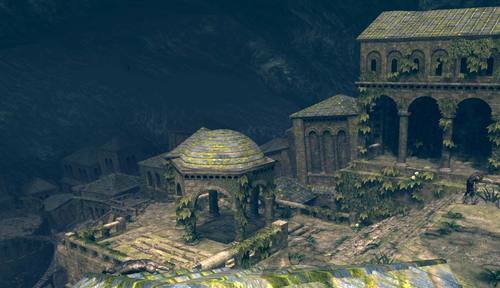 Oolacile was a kingdom that existed in Lordran, in the area now known as Darkroot Garden, about three or four centuries before the events of Dark Souls. As Dusk, Princess of Oolacile, states, Oolacile was a land of sorceries, but the sorceries featured by Oolacile's Sorcerers were very different. She also states that the lost kingdom has been "reduced to ashes" long ago. This would explain why there's practically nothing left of the Township or the Sanctuary in the present. Oolacile's fall is mysterious and sinister: in times of peace in the kingdom, Oolacile's inhabitants were convinced by a dark serpent to dig up the grave of the Primeval Man. Then, something happened, and the Primeval Man was transformed into a beast that unleashed the Abyss. The Abyss, corrupted dark, destroyed Oolacile and transformed its inhabitants as well. Artorias the Abysswalker, in order to hunt Darkwraiths (servants of the Dark) had entered a covenant with an unnamed creature from the Abyss, and received a ring that would allow him to traverse the Abyss unharmed. Naturally, Artorias soon came to Oolacile in hopes of stopping the spread of the Abyss. It is not certain if he knew at the time of the severity of the situation, or of the existence of Manus, but, in the end, he would either never come to face the Father, or would would be defeated by him. In current day, the Chosen Undead is dragged off to the past by Manus if specific requirements are met, traveling to the land of Oolacile. 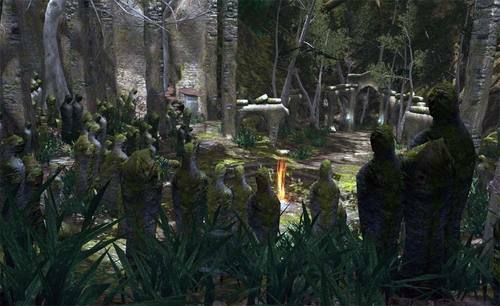 Approaching the area where Dusk is initially saved, with the Pendant in one's possession, will reveal a shadowy portal. Below Oolacile, the sorcerers of the land discover "Dark" sorcery, sorcery that uses the power of Humanity, the powerful life force in all humans. This sorcery was very powerful, and extremely lethal, and quickly became the sole focus of the sorcerers. Striving to create even more Dark sorcery, the sorcerers decided that, in order to better understand Humanity, they would have to observe it being pushed to the absolute limit. They began taking citizens of Oolacile, and torturing them endlessly, observing their Humanity, and twisting it cruelly in both physical and mental anguish. This continued for some time, and caught the attention of a Primordial Serpent, whose identity is a mystery. It is said that the serpent came to the sorcerers of Oolacile, and urged them to dig below, that all their questions would be answered with what they would find. As I'm sure they came to regret, they heeded this advice, and stumbled across a grave. The grave of of Primeval Man. The sorcerers upturned this grave, and awoke the primeval man. Being a human so ancient, it is presumed that its Humanity would be extremely potent, or abundant. This would have delighted the sorcerers, and eagerly they began to torture it, apparently in a small room, with chains dangling from the ceiling. Different hints state that Oolacile is not any arbitrary land in the past but the FIRST of all humans in general. It is described as a land of golden sorceries. This seems to be paradisiac conditions. Sorceries of Oolacile are not offensive. This indicates a time without war or crime. This could also be described as a state of paradisiac conditions. The inhabitants of Oolacile were fooled by a (primordial) serpent. In the present, Oolacile is described as a lost land. It is lost and no more accessible for humankind. Within Oolacile no hint can be found that in this time any other human land (or kingdom) exists. Marvellous Chester notes, that the people of Oolacile turned up the grave of primeval man. If he is buried in Oolacile, he presumably lived here. Therefore it is the place of the first humans ever. Also important is the area where Oolacile is located at. In the present, the land is lost and forgotten but not the Abyss who has its origin there. Gough notes that by killing Manus, only further corrosion is prevented. So the Abyss didn't spread but persists through the ages. This means that Oolacile must have been located where the Abyss remains in the present. Consider the placement of New Londo, the Darkroot Basin or any other nearby place. They are in general the area where the player walks through in the present. This results in an important consequence: The origin of all four Lord Souls as well as the kiln of the first flame - everything a reference to the beginning of existence - is close together. Therefore Oolacile seems to be the birthplace of humankind, like the Christian paradise. Additionally Oolacile is not stated as a kingdom but only as a land ("lost land" or "land of golden sorceries"). There's also no hint for a king or a ruler of Oolacile in general - despite the Royal Wood or that Dusk owns the title "princess" - which makes Oolacile also a paradisiac place where everyone is even. The sorceries of Oolacile differ from the magic of thine age. It is difficult to explain…Oolacile sorceries are, what doth one say? They are somewhat… of an approximation. But to you and I, it's all ancient history. This enchanted ember, a form of sorcery, is a vestige of the lost land of Oolacile. Sorcery catalyst of the lost land of Oolacile. Formed by enchanted whitebark branches. Boosts sorcery adjustment, but lost land sorceries are not offensive, and attacks are not affected by intelligence. The whitebark boosts sorcery adjustment, but the sorceries of this lost land are gentle and not affected by intelligence. Ancient sorcery of the lost land of Oolacile. Turns right weapon invisible. Not a simple augmentation, making it dependent on the skill of its caster. An example of the capacity of Ooalcile sorceries to control light. Ancient sorcery of the lost land of Oolacile. Cast a bright light upon surroundings. This light-producing sorcery is elementary but nonetheless demonstrates the achievements in mysticism of Oolacile. Such magic has not been developed even in Vinheim.